BASES DE CONVOCATORIA DE SUBVENCIÓN MEDIANTE RÉGIMEN DE CONCURRENCIA COMPETITIVA PARA ADECUACIÓN DE ELEMENTOS DE CARPINTERÍA EXTERIOR EN CONJUNTOS HISTÓRICOS. BASES DE CONVOCATORIA DE SUBVENCIÓN MEDIANTE RÉGIMEN DE CONCURRENCIA COMPETITIVA PARA LA CELEBRACIÓN DE CERTÁMENES DE TEATRO. BASES DE CONVOCATORIA DE SUBVENCIÓN MEDIANTE RÉGIMEN DE CONCURRENCIA COMPETITIVA PARA FOMENTAR LA CONSOLIDACIÓN Y MANTENMIENTO DE BANDAS, CORALES Y ESCUELAS DE DULZAINA. EXPOSICIÓN AL PÚBLICO EL INICIO DEL PERÍODO DE COBRO VOLUNTARIO DEL PADRÓN FISCAL DE TASA Y PRECIOS PÚBLICOS QUE SE RELACIONAN. RESOLUCIÓN DEL EXPEDIENTE DE CONCESIÓN DE UN APROVECHAMIENTO DE AGUAS SUBTERRÁNEAS EN EL TÉRMINO MUNICIPAL DE TORNADIZOS DE ÁVILA. 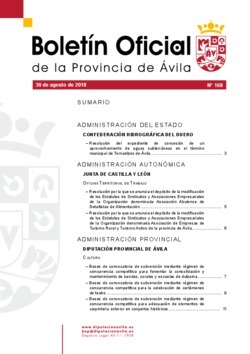 CONVENIO DE COLABORACIÓN ENTRE EL AYUNTAMIENTO DE SOLANA DE ÁVILA Y LA DEMARCACIÓN TERRITORIAL DE ÁVILA DEL COLEGIO OFICIAL DE ARQUITECTOS DE CASTILLA LEON ESTE, PARA LA CONCESIÓN DE LICENCIA URBANÍSTICA.